In her latest documentary, Deborah Koons Garcia expertly introduces the audience to a subject that isn’t obvious–the beauty and bounty of the world’s dirt. The movie portrays what we take for granted in a whole new light, digging down a bit and helping the audience understand the importance of what we have before it’s too late. Koons Garcia is not new to the world of documentaries and especially agriculture-related documentaries. 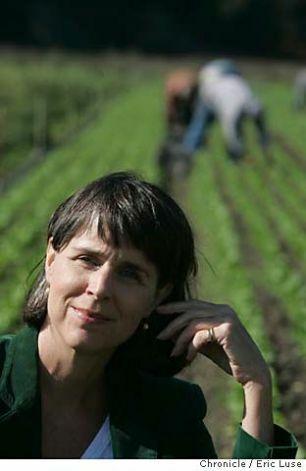 Her previous work, The Future of Food exposed the truth of genetically modified foods (GMOs) and the revolving door of government that allowed GMO crops to come to the market and for them to reek havoc on our environment as they do. Symphony of the Soil is an elegant counter-part to the somewhat daunting news of GMOs and their environmental and health effects. Garcia’s new film celebrates what we have: the life-giving nature of soil. The characters she chooses to relay specific information expertly convey the importance of their subject matters from mycelium to compost to rebuilding topsoil. The passion in each of the people speaking comes through and inspired me to fall in love with the soil. The movie gently reminds the viewer that the soil is the reason for life on this earth and the mechanism to maintain that life. Whether it is the luscious topsoil of the great plains or the vibrant earth of the rain forests, every soil is teaming with microbial life that literally allows life on the planet to flourish in all its multitude of forms. It’s no secret that recent modern developments have threatened the ability of the soil to maintain the abundance of life it is host to. The movie gently touches on these threats without becoming preachy or hitting us over the head with self-righteous indignation. Garcia, through her passionate and highly relatable experts, gives us an opportunity to see the destruction we’ve caused and make amends with the soil. Each of the chosen experts in their fields offer applicable solutions whether it is cultivating mycelium, composting, growing cover crops or thwarting drought by building topsoil. Any of her solutions are attainable through small actions. The movie gives a long overdue tribute to our real worldly treasure—our soils–and invites us each to share in the passion that will cultivate our soils for future generations. While not an easy feat, the artistry of the producer shows that it IS possible and the rewards are tremendous. Indeed—it is portrayed as an inspiring venture—a soft challenge with the greatest rewards! For cinematic pleasure, the images and scenery of Symphony of the Soil are set to compete with any picture anywhere. Garcia uses the natural beauty of scenic landscapes around the world to draw in the viewer and show what is possible in a world that honors the role of the soil. As eye candy and an educational tool, she time-lapses gorgeous shots of seeds germinating, fungus growing, bacteria multiplying all for a riveting look at the wonders under our feet that we take for granted but that truly sustain all life. This movie is at once a riveting experience, a warp-speed education on our life-giving soils and an awakening of the soul. You will revel in the film and the information. Find a screening here or buy a copy here. Either way, you are in for a treat and you will fall in love with dirt!